This large ceramic vessel has the shape of a type of lamp used in the Middle East throughout the Medieval period. The pear-shaped lamp has a waisted body, rounded below and flaring above, as well as a foot ring and three suspension loops. The most common kind are made of glass. Magnificent examples were made in Egypt and Syria during the 13th and 14th centuries. Decorated with gilding and enamel colours, they were often made to light religious buildings, where they were suspended above the worshippers' heads. This lamp is the sole survivor of the fittings of this type made for the Süleymaniye mosque in Istanbul, which was inaugurated in 1557. It was almost certainly made at Iznik in north-west Turkey, and it is important as the earliest dateable example of an Iznik piece with the colour red in the decoration. The red was created using a slip made by diluting a special type of clay, but here the slip is too thin to create a solid colour. Therefore, its use here should be viewed as experimental. From this date on, however, a thickly applied, deeply coloured 'relief red' became a common feature of Iznik wares. The large bosses found on the side of the ceramic lamp, and the two ornamental mouldings, suggest that its form is derived from a metal prototype, which may have had decorative perforations through which the light could be seen. Such lamps of metal were also suspended in mosques for lighting and decoration. The opaque body of the ceramic lamp would have made it very inefficient as a lighting implement, and it seems that its role was symbolic. This is supported by the inscription that runs around the upper section. The wording, taken from the Holy Qur'an, reads, 'Allah is the Light of the heavens and the earth. The likeness of His Light is as a wick-holder wherein is a light' (surah XXIV, verse 35). 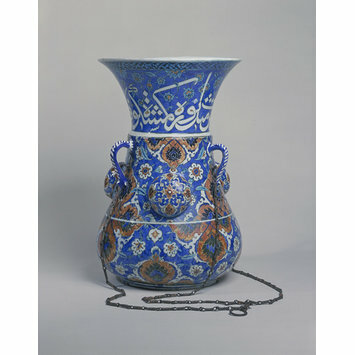 Large pear-shaped ceramic mosque lamp, with a wide expanding neck. There are two handles around the shoulder (the third is missing) which alternate with three large round bosses. The original suspension chains are still attached to the handles. The decoration of large repeated floral motifs is underglaze-painted in cobalt and turquoise blue, black and red. The inscription on the rim contains verses from the Light Verse (Quran 24: 35), which was a verse commonly used on mosque lamps. This lamp was made for the Sulaymaniye Mosque in Istanbul, which was completed in 1557, and is historically important because it allows the dating of the introduction of relief red into the standard palette of Iznik pottery. Historical significance: This mosque lamp is the earliest dateable example of the use of relief red (Armenian bole) in Iznik ceramics. We know that it was made for the Süleymaniye Mosque complex in Istanbul, which was built between 1550 and 1557, when the building was inaugurated. The red used on this object is still quite thin, and the mismatching parts of the design suggest that it was an experimental object. However, from this point on, red becomes an essential element in the Iznik palette. 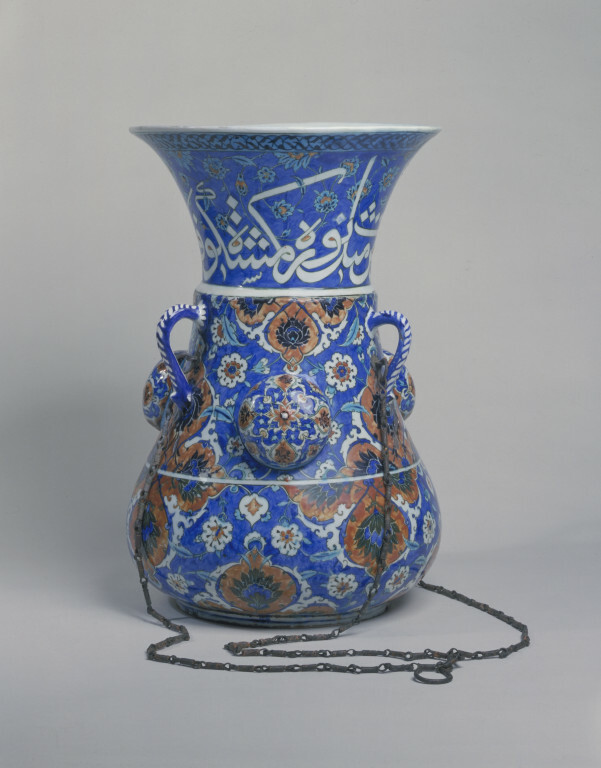 Fritware mosque 'lamp' made for the Süleymaniye Mosque in Istanbul, Turkey (probably Iznik), about 1557. Atil, Esin, The Age of Sultan Süleyman the Magnificent. Catalogue of the Exhibition held at The National Gallery of Art, Washington, 25th Jan - 17th May, 1987; The Art Institute of Chicago, 14th June - 7th Sept., 1987; The Metropolitan Museum of Art, New York, 4th Oct - 17th Jan., 1988. Washington: The National Gallery of Art and New York: Harry N. Abrams, Inc, 1987. ISBN 0-89468-098-6 (paper), 0-8109-1855-2 (cloth). Plate 191, p. 322, illustration p. 266. Atasoy, N., and Raby, J. Iznik: The Pottery of Ottoman Turkey, Istanbul/London, 1989, 224. Watson, O. 'An Iznik Mosque-Lamp,' Oriental Art 35:4, Winter 1989-90, 194-5. Fritware with polychrome underglaze painting. This dramatic object was made for the Süleymaniye mosque in Istanbul, completed in 1557. Its shape is based on a metal lamp. The upper section bears part of the Light Verse from the Qur'an. The middle section is equipped with suspension handles and large, decorative bosses. It is the earliest example of Iznik pottery with under-glaze decoration in red, a difficult colour to produce. The potters were still experimenting when they made the 'lamp'. The red is quite orange and unevenly applied. Made for the Süleymaniye Mosque in Istanbul.